Today most people consider the Ford Mustang to be the original muscle car. After all, it did start a revolution of sorts with companies building smaller cars with bigger engines to satisfy the appetite of the American consumer. Its seems to us that one legendary automaker, now more known for building your grandfather’s car, was poised to begin the horsepower arms race in the early 1950s. Oldsmobile was part of the larger General Motors conglomerate that had strict marketing and production plans for its various monikers. 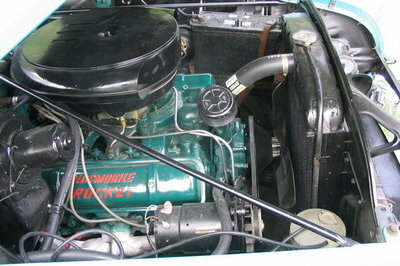 The cars that utilized a big V8 were strictly Cadillac and LaSalle models. The main reason they needed a V8 was to move their behemoth bodies around, but GM also felt it helped distinguish those cars as the top of the line models. Oldsmobile was about to shake things up in more than one way. For starters, if they were going to make a more powerful production car that was also exhilarating to drive then they were going to need a completely new car body to work with. At that time, the company had the compact 76 series cars and the very large 98 series. The company decided to use the underlying chassis of the 76 series, put a brand new V8 under the hood, and design a body to mimic the space race era. 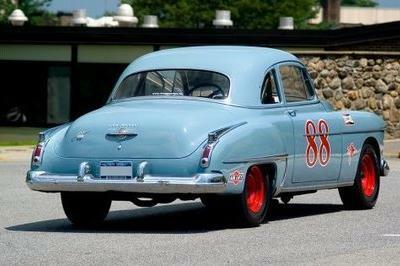 This would all come together to be the Rocket 88 car that is now legendary and truly began the muscle car era way back when it was introduced in 1949. Let’s try and forget the full-size Oldsmobile 88 models that were produced all the way until 1999. That is not where the original idea of the 88 began and certainly not where the designers wanted to see their car end up. When Oldsmobile decided to add a new model to the lineup it began the search for what type of body it would use. At the time, General Motors was a virtual tool box of various car pieces and the designers decided to opt for a modified version of the Pontiac Streamline/Chevrolet Fleetline body. The new car slotted in right between those two by being longer than the Chevy and just shorter than the Pontiac. When saying that this was a “smaller” car for Oldsmobile, one must take that notion with a grain of salt. The car was 202 inches long and 75.2 inches wide making it much larger than some European counterparts. 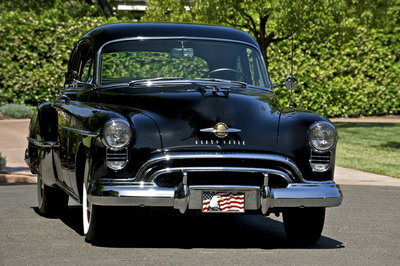 Nonetheless, this new Oldsmobile had a few tricks up its sleeve and began to outpace its Pontiac and Chevrolet cousins. 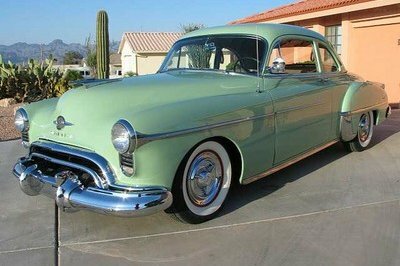 This was a chance for Oldsmobile to change its outlook and perception in the public eye and began to call its styling “Futurmatic.” Even though the body style was rather progressive for the time, it was nothing new and had essentially been around for 10 years. Oldsmobile added some new vents under the front headlights and some nifty badges, but nothing crazy. The rocket hood ornament was even an option on the car, for which it would cost you $5. Inside the Oldsmobile was a typical 1950’s American sedan. Covered in layers of chrome, the dashboard of the Rocket 88 was basic, but included more functionality than the cheaper models from Pontiac and Chevrolet. A deluxe trim option was available which included a dashboard clock. Basic instruments were included, but options such as a radio were not cheap for the day and could run nearly $100. Taking a look on top of the steering wheel one will notice the transmission selector. Look even closer and you’ll see that there is no position for park. The hand brake was the only way to bring these Rockets to a halt, but with the new engine under the hood, stopping was the last thing on your mind. The newly developed advanced design group of Oldsmobile was taxed with creating a new overhead valve V8 engine. Towards the end of World War I, the chief researcher at General Motors was Charles Kettering. He had been developing a higher compression engine to replace the more popular flathead designs in use by most manufacturers. He felt that the higher the compression ratio than the more energy and engine could extract from the fuel while it burned. The first Rocket motor was a 303 cubic inch V8 that significantly outsized the former inline. 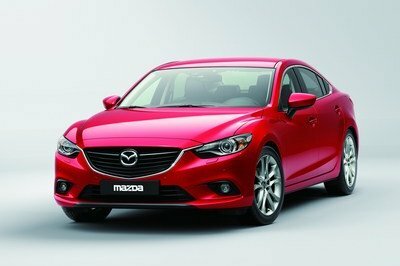 The new engine was rated at 135 horsepower and 283 lb-ft of torque. The increased compression ratio also helped the car improve upon fuel efficiency by 10%. Two interesting stories surround this engine beyond just its development. Charles Kettering was undoubtedly the inspiration and genius behind this new engine, but General Motors had a rule against naming engines after living people. This led to the Rocket name, which was originally disliked by many of the top Execs. 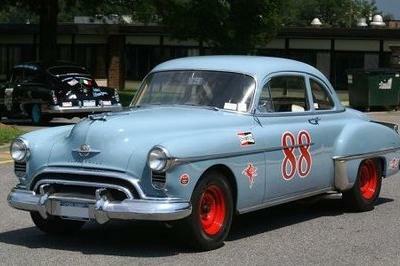 Turns out that the name would be one of the most memorable in Oldsmobile history behind maybe Hurst/Olds and the 442. The engine’s horsepower ratings are also a subject of debate and many feel that the engine was deliberately rated below the V8 Cadillac models. Once the new Rocket V8 was mated into the car it became clear that Oldsmobile had created something special. The car could make the run to 60mph in roughly 13 seconds, which may sound slow today, but this was stunning in 1950. The car barreled pass 60 on its way to 97mph where physics eventually overtook the new rocket and did not allow the car to top over 100mph. In the end, the acceleration number could be beaten by some cars, but the Rocket would reach a higher top speed and others could beat its top speed, but took much longer to make it there. Oldsmobile had successfully created one of the fastest cars in America decidedly beating Ford and Chrysler models up and down the street. Less impressive features of the car were simply standard for the time period. The mechanical drum brakes did bring the car to a stop, but there’s no telling how long that might have taken from nearly 100mph. As typical with other American sedans, the Oldsmobile was heavy and sat on a softly sprung suspension system, making it roll heavily in any corner. Eventually anti-roll bars would be included on the sedan helping to improve handling. Because Oldsmobile was able to produce this car so quickly and quietly, it was able to enjoy a period of no competition. The party was over by the mid nineteen-fifties when every other manufacturer had taken the OHV V8 design and made it their own. Dodge, Plymouth, Pontiac, AMC, and Lincoln all created similar models that eventually outpaced the Rocket. Making the problem worse was the fact that Oldsmobile eventually strayed away from the original idea of the car. It grew larger and more out of shape throughout the 1950s and eventually turned into the full-size sedan that we still see on the streets today. 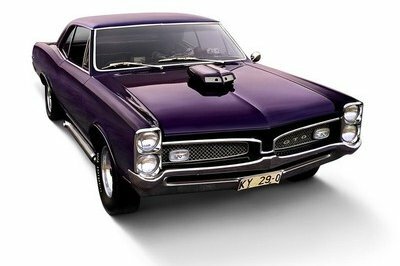 Even though this car was taken over by the competition, it holds its place in automotive history as the oldest muscle car. Anyone who considers the mustang to be the original "muscle car" is retarded. They were classified as pony cars, along with the camaro, and challenger. 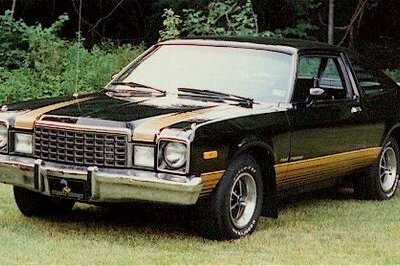 Muscle cars were cars like the ford torino, chevy chevelle, and dodge charger. I love this vehicle for having an old look! 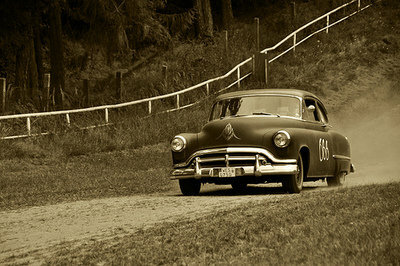 I wonder if it still exists today, but I would surely love to see and try driving this car! However, I noticed that it looks so big and heavy. Even though it looks so outdated because of its platform, I must say that it still looks very attractive at that. Anyway, I can’t see anything wrong if there’s someone wants to have a vehicle like this. I doubt if you really want to have one Michael. There are more beautiful cars in our generation, so I think it is not advisable for us to buy this stuff. By the way, the car is very fast but is outpaced. I can say that the car is really fast. It is a like a rocket, but I think, it is too big and the designs are old. Hopefully, they can make other versions of this one because I would love to have one. Well, I guess it would be better if the Oldsmobile would do the overhauling for their car, just like what the Volkswagen done with the Beetle or at least offer a 250 mph. Obviously, the car look so vintage. The engine technology was outdated and It seems that the Oldsmobile doesn’t have any plan of boosting the power output of the car. I don’t think that that this car can compete against the modern and high speed performing vehicle. I would say that this one is really old already, but I am still loving the way that it looks. I wonder what this baby would look like if Oldsmobile decides to revive it. I really wouldn’t be surprised if Oldsmovile releases a lot of its previous models. That’s really quite the trend nowadays, when one re-release succeeds, expect others to follow suit. Well, I really wouldn’t be surprised if they would actually release an updated version of this car soon. 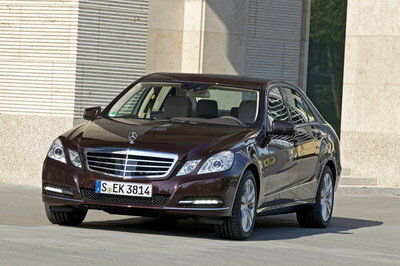 In fact, I would be looking forward to that since I think that this car is really great. Yeah, I would agree. Oldsmobile really has all the rights to bring back this car. If you think of it, this car is considered as one of the icons during its time. Oldsmobile is definitely one of those companies that make these cars a lot, despite the designs being a throwback to an older age. Despite that, they made sure that the car will be able to maintain its quality. Wow, classic cars are definitely make a big comeback this year. And for Oldsmobile, this one is really one of their best models back then, so it deserves a comeback. hmm. Most probably I will considered Ford Mustang as the original muscle car based from what I’ve understand. I think everyone will agree with me if I say that Mustang looks sporty and aggressive than this car. This oldmobile looks more of a Volkswagen hatchback Beetle.